Forget about the stresses of working on Wall Street: the most stressful thing I did last week involved walking into our town's local Mexican specialty food store, breaking out my high school Spanish, and asking for a type of chile that until two weeks ago I'd never even heard of. But I just saw an episode of Daisy Cooks! on PBS that made me drool like nothing I've seen on TV in years (I don't normally drool). After twenty minutes of watching her cook the very recipe I'm going to write about today, I'd been cured in advance of my next several cases of cooking burnout. So I bought her new cookbook* and made Braised Pork in Guajillo Chile Sauce. Below I'll share the recipe and my experiences making it. Bottom line: it was a huge hit in our home, and it's one of about 40 recipes in her cookbook that I can't wait to make. I'll be adding this cookbook to my collection shortly. But back to my guajillo chiles. When I'm considering a new recipe, I typically use the five easy questions test to decide if a recipe is worth cooking. In this case, question #2 ("does it contain any bizarre or impossible-to-find ingredients?") could have been a key failure point. Fortunately, in our town we've got a pretty big Latin American population, so I have two local Mexican specialty food stores to choose from. Daisy herself suggests places like mexgrocer.com, amigofoods.com and cubanfoodmarket.com where you can buy hard-to-find ingredients online. So if you decide to try this recipe, don’t let the one unusual ingredient stop you. It can be found more easily than you’d think. But I was far too impatient to wait for my guajillo chiles to arrive in the mail. And as I suspected, the girl behind the counter didn't speak a lick of English, except for a friendly "bye!" which she said to me as I walked out the door. But I asked my question (and she actually understood me), and she sold me an enormous bag of guajillo chiles for just $2.50. And yes, I took the hot ones. I have a hunch Daisy will be sending me back there soon for some other ingredients. Slightly modified from Daisy Cooks! 1) Put the pork in a large pot and cover in cold water by 2 inches. Add the salt and bay leaf. Bring liquid to a boil and simmer, covered, for 1 hour. Skim off any foam as necessary. 2) Bring 3 cups of water to a boil in a medium saucepan. 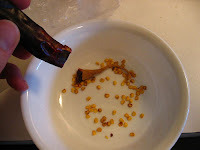 While the water is coming to a boil, remove the stems from the chiles and shake out the seeds. Heat a nonstick pan on medium heat. Toast the chiles in the pan, turning them frequently, until they start to change color and crisp up a bit, about 4 minutes. 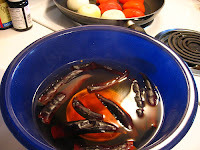 Lift the chiles out and place them in a bowl and pour enough of the boiling water over the chiles to cover them fully. Soak for 20 minutes until chiles are softened, then drain well. 3) While the chiles are soaking, place the onions and tomatoes, cut sides down, in the skillet. 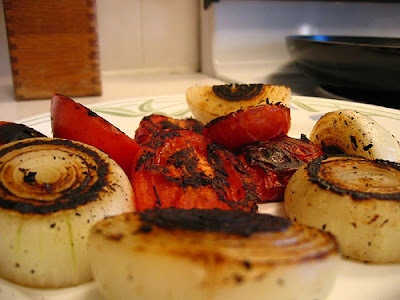 Turn heat up to medium high and cook, turning the vegetables until blackened on both sides. 4) After the pork has been simmering for 1 hour, remove 2 cups of the cooking liquid and pour it into a blender or food processor. Add the onions and tomatoes and puree until smooth. Then add the chiles and puree until smooth. Remove another 2 cups of the pork cooking liquid and set aside. Drain the pork and wipe out the pot. 5) Set the pot over medium heat and add the canola oil (please, only use lard if you truly have no respect for your arteries). Stir in the flour and cook for 3-4 minutes. Pour the pureed chili sauce into the pot, add the pork and simmer, covered, for another 1 hour. If the sauce becomes too thick or isn't fully covering the pork cubes, you may add some of the remaining 2 cups of cooking liquid to the pot. 6) Serve with rice, makes enough for 5-6. 1) Don’t try and substitute any other kind of chili here. First, Daisy will probably hunt you down and kill you. 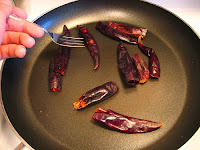 But also the guajillo chiles add an unusual dimension to the sauce. They have a smoky, almost chocolate smell to them (hmmmm, might explain why I like them so much), and doubtless this is part of the authenticity of the dish. A further note: these chiles can be pretty hot. If you don’t like very spicy food, you can try halving the pepper count to five instead of ten. We used only six chiles the first time we made it, but I have to admit now that I regret not doing the recipe by the book first. We definitely could have handled the extra heat. I’ll be using the whole ten on my next attempt. 2) As you can see from the photos, when Daisy says "blacken" she really means it. 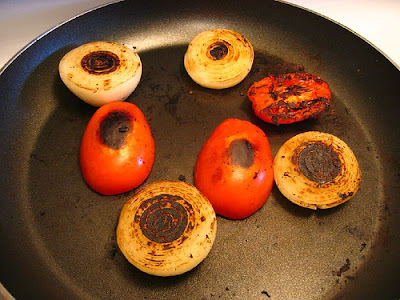 You have to literally burn the onions and tomatoes. 3) I’ll note that TV version of the recipe differed slightly from the cookbook, although in fairly minor ways. For example, in her show, Daisy has you brown the chiles in a dry pan (same as with the veggies), but the cookbook inexplicably tells you to brown the chiles in oil. I corrected the cookbook version above to match the show. There were also some modest differences in cooking times too, but again these were minor. 4) Finally, I highly, HIGHLY recommend this cookbook for any adventurous cooks out there who want to sample some truly authentic yet accessible Latin cuisine. Click the graphic link below to go directly to Amazon.com. Once again, you are welcome to take a look at the full photoset from Flickr for a larger collection of pictures on the making of this recipe. * Note: if you enter Amazon via a link on my blog and buy something, I'll get a small commission on that purchase. Please think of it as my "tip jar"--and thanks so much to those readers out there who support me! That looks awesome! Can't wait to try it. This was a really fun recipe to try out... it seemed at first to be a stretch for us cuisine-wise, but it turned out to be easy. I was looking for an authentic recipe for braised pork in some kind of chile sauce and came across your website. We LOVED this. Thanks! I happy to hear it, thanks for commenting! I say Daisy on PBS make this 2 days ago and had to try it. Her site is contaminated so I was not able to visit to get this recipe but was so happy to find it here. It is cooking as I type and I just tasted it and wow what flavor. I could not find the Guajillo chilies so I used the dried ones I could find and added 2 t cocoa powder and 1t instant coffee and it did add a depth that was missing. Thanks for posting! Hi Shayne, thanks very much for your comment. Your modifications are really interesting--I'm going to have to try them sometime. Thanks for reading and for the feeback! I saw the show, and just like you, I couldn't wait to try this recipe. I came across your site in my Google search for the Daisy's recipe. If it tastes half as good as it looks, it's a winner. Making this for dinner tonight. Found your blog after googling "what to do with the ginormous bag of guajillos my husband brought home from the Mexican grocery store." LOL carpoolqueen! See how useful Google is? :) Enjoy your dinner and let me know how it comes out. Yum! We liked it a lot. I'll definitely make it again, and next time, I think I'll add a couple of different types of chiles to layer the flavor of the sauce. So happy you enjoyed the recipe! This is a big favorite at Casual Kitchen, and readers seem to really like it too. Glad you had a good experience. Ever since I watched Daisy cook this, I've been dying to do the same and now it's simmering on the back burner! DK, thanks SO MUCH for publishing this; I tried to find Daisy's recipe but w/no success. I can't believe it has no garlic, oregano, etc. and yet smells to die for!! Thanks again, really appreciate your help!!! Oh, sorry! I meant to say "Shayne". No worries at all Shayne, thank you for the feedback and for your comment! I hope you enjoyed your meal. It's simmering on the stove, and it's the second time I have made this dish. I thought I would have remembered all the points of the recipe after seeing Daisy cook this on her show, but NO! So I googled and found it here and was so glad I did. The pictures really help to simplify everything. This recipe is so very delicious, hard to believe because so few ingredients are used. The first time I made this we used it the next day to make soft tacos with the meat I shredded, those were also a hit! Thank you so much! Stella, thank you for the feedback, and I'm so happy to hear you had great success with this recipe. Thanks for stopping by! 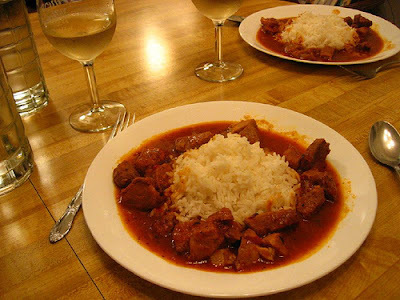 The last picture reminds me of the Chile Colorado I just posted... the idea of something similar, with pork... mmmm. Yes, must make. absolutely gorgeous! bought the chili's without a recipe and found this one. Can't wait to try it. Thanks for the recipe and your blog. I just loved it. I made this and it was so yummy - making it again ! !